A corrections officer is being charged with embezzlement after investigators say he stole money meant for inmates. 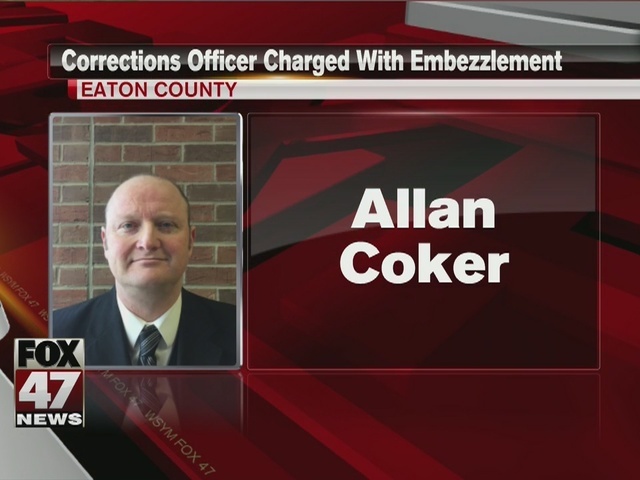 Allan Coker of Eaton County was arraigned on a charge of embezzlement of over $50 by a public official Monday. The Eaton County Prosecutor's office says the investigation started in December 2015, when the Eaton County Sheriff's Office Corrections Command noticed some discrepancies regarding small amounts of cash not being deposited into inmate accounts during the booking process. The investigation found the same corrections officer was involved in each of those bookings. An outside team was brought in to conduct the investigation, which led to Allan Coker, a corrections officer who has been employed since 2010, who was placed on leave during the investigation. Coker eventually admitted to violating procedures and resigned.